Education in Human Nature 101* is the bomb down the ventilation shaft of the Death Star of false presumptions** that underlie today’s political discourse and are the root cause of so much divisiveness and rancor. We use the false presumptions to: 1) dehumanize one another, which makes it easy for us to vilify each other as evil monsters, and 2) speak different languages, in which words like Liberty, equality, Justice, and fairness, mean very different things, AND WE DON’T KNOW IT, so we’re always talking past each other. The goal of my education recommendation is to remove those tools and methods from the mix, and to force both sides to face each other: 1) on the common ground of a more accurate and complete grasp of how and why we humans think, say, and do the things we do, and 2) with a common language with which to express our differing views, which forces us to be clear about which version of Liberty, equality, fairness, and Justice we’re talking about. We’d have to find new ways to argue. And liberalism and conservatism as we currently know them would probably morph into something very different that at present is unknowable. But the prospect of political discourse based on truth rather than on mythology is worth the leap into that unknown. I honestly truly believe that we are morally obligated to do everything we can to make this transition come true. We owe it “to ourselves and our posterity” to make this happen. The question is, do we have the will? Will the liberal hegemony over the education system allow some of liberalism’s most treasured sacred myths to be replaced by truth? Will liberalism be able to live up to its ideals of open mindedness, tolerance, inclusiveness, and evidence-based logic? That’s the gauntlet we must throw down. It’s our best chance to move our culture away from the bitterness that currently infects it. 5) Basic rules of argumentation and evidence. 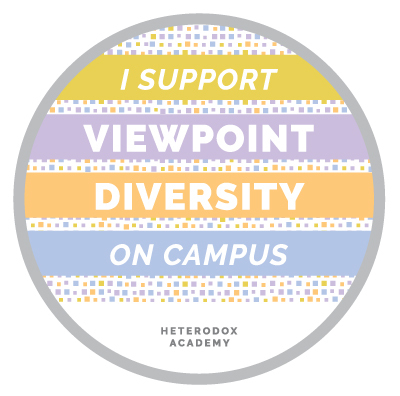 The list of “entrenched yet questionable orthodoxies” on Heterodox Academy’s “Problem” page is just the beginning. A more comprehensive list, and why it’s important to fix this problem, is in one of my blog posts, Falsehoods and Truths.